Two recent pieces of news from the Los Angeles Dodgers: their organist Nancy Bea Hefley is playing a lot less than she used to, and they’re considering adding a mascot (no link available, but there was a story in today’s L.A. Times that, if today were April 1 and not June 1, I would have thought was fake). By the way, the Major League Baseball organist situation isn’t quite as dire as the Seattle Times column makes it out to be. Their list of organists is incomplete. For example, the Tampa Bay Devil Rays have a live organist, believe it or not, to name one team they didn’t mention. His booth is next to, but not inside, the press box, and I was just a few sections over from it at the game last month. I only realized afterwards that I should have gone over there to see if he took requests. Levi: Hey, don’t knock Milton Bradley. thatbob: Oh, see, I have a deep and profound love for annoying mascots that I’m surprised you don’t share, Jim. But at least if they get a Trolley Dodger, they’ll have to get a trolley, no? Wouldn’t that make you happy! LA hasn’t had one of those since, what, the 1940s? I hope it’s a big pink and green trolley made of balloons and glitter that runs back and forth across the backfield. Isn’t that the kind you like? Jason: Bernie Brewer was never annoying. Levi: If the Dodgers get a mascot, who’s next? A big, stinky Red Sock? A plastered Trixie named Cubbina? 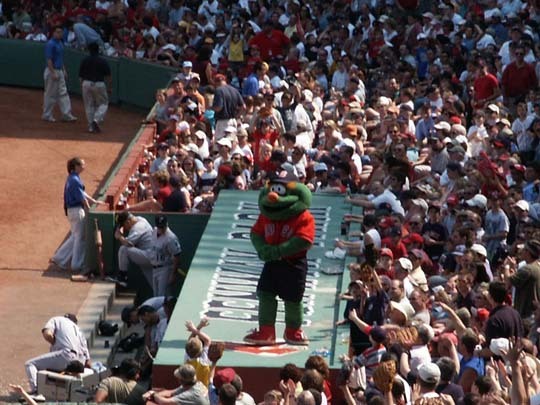 Jim: The Red Sox have a mascot: Wally the Green Monster. With hit after hit after hit over the last week, Albert Pujols appears to be back, having shaken the slump that had dogged him all season. He’s now got an on-base-percentage of .404 and a slugging percentage of .612, very close to his career numbers. Kind of out of nowhere, he’s now leading the league in home runs, too. And you can tell just by watching him on TV that he’s hitting like the Albert Pujols we’re used to seeing, no longer getting off-balance and out on his front foot. What’s funny about it is that, according to Buck Martinez on ESPN yesterday, Albert broke out of his slump when his wife, Deirdre, pointed out to him while they were watching tapes of his at-bats that he had spread his stance out too much. She talked to Albert about it, and also to hitting coach Mitchell Page. Now, I have always heard that the general philosophy of most hitting coaches is to use whatever works (Walt Hriniak and Charlie Lau excepted), but don’t you think that would be a bit irksome, to have a player’s wife come tell you what to look out for? Even if she’s right–and even if you hadn’t noticed the problem yourself, your pride would surely suffer a bit. This led Bob and me to a discussion of whether maybe Deirdre is as a good a hitter as Albert, but she stays home with the kids because it’s good for a kid to have a parent at home. Bob suggested that maybe she’s Polly Ann to Albert’s John Henry. Let’s just hope that Albert never has to test himself against an electronic hitting machine. Although it sure would be fun to hear the fans scream, “The upper deck’s caving in!”, and Albert respond, not losing a beat, “That ain’t nothing but my bat sucking wind,” as he drives another ball over the Arch. Toby: It doesn’t really have anything to do with Pujols, but happy birthday, Levi. thatbob: Pujols is probably worth the ink, don’t get me wrong. But in the coming years, try to be careful not to fall into a Bob Greene or Bob Costas wanting-to-slobber-all-over-Michael Jordan’s-(well, let me try to keep this family related)-NBA-championship-rings kind-of relationship. It’s a fine line to walk, I know, but as a married man, it’s your job to walk it. Jason: I’d like to see what Mrs. Jose Lima has to say about this. Actually, I just like to see Mrs. Lima. Levi: Well, Pujols did go 5-5 last night with two doubles and a home run, and he cured cancer during the seventh-inning stretch, but your point is taken, Bob. I won’t mention it. Oh, and it’s not ink: it’s bytes. Levi: And thanks, Toby. Back in the day when you could buy ten or twelve tickets to a Cubs night game without planning very far ahead, I would have had a birthday party at the ballpark, and brought a cake. But this year, we just had some people over for barbecue Monday and watched the game on TV last night. It was a pleasant birthday.